You're here because you're looking for information about the route of Ganges river and a Ganges river map, hopefully you'll be satisfied with the Ganges maps below.. The route of Ganges river is long and winding meaning that it directly and indirectly affects the largest population of any river in the world. It is certainly one of the greatest rivers in the world and continues to be a lifesource for the millions upon millions of Indians who depend on it. The Ganges river is in the North of India and originates in the Himilayas before draining into the sea in the Bay of Bengal. I have outlined some of the key stages of the route of the Ganges river and you can find some maps further down the page. 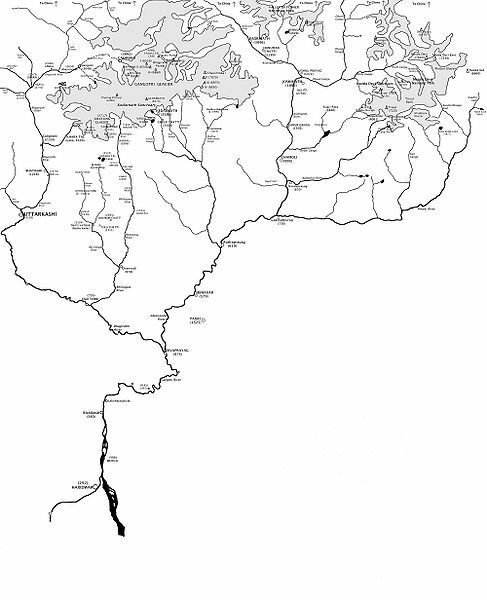 The Ganges river map below highlights the main route of the Ganges river from high in Himalayan mountain range to the lowlands of the Bay of Bengal. 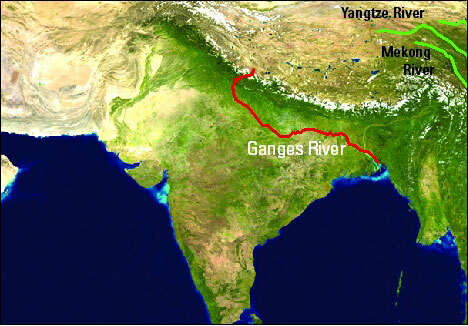 The figure above shows the main origin of the Ganges river whereas the map below follows the main route of the Ganges. This, the main page of the Ganges river give complete information about everything the river represents and means to the world and manily the people who live along it. Rebbecca from Rancho Cucamunga asks this rather important question and is provided with a detailed route of the Ganges river from Tony. This amazing creature still somehow survives in the murky waters of the Ganges river although still greatly under threat from extinction.